Students can write stories to go along with these pictures. 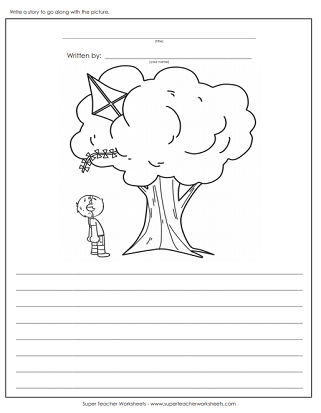 Each worksheet includes a fun cartoon picture, and a few sheets of lined writing paper. Write a story to go along with the picture. The illustration shows a father and son on a fishing trip. The father's got a tiny fish and his son has a giant fish. 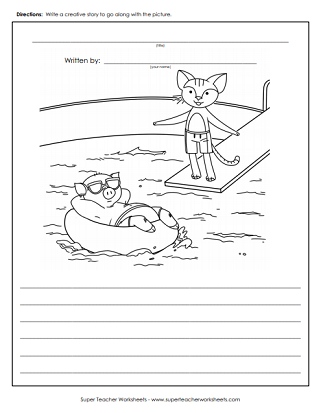 A pig is floating in a swimming pool and a cat is getting ready to dive in. This picture shows a fierce dragon presenting flowers to a lovely lady. Why is there a kitten in a tree? What is the little girl saying to the kitten? A woman is standing in front of a large jar of candy corn. What's she saying? A child is walking past a box with a puppy in it. One the side of the box is the word "free". A young girl sneaks in her baby sister's room. What does she see? The baby is in a crib crying. What will she do? Two kids are passing a beach ball to each other in a swimming pool. Write a creative story to go along with the picture. A young boy with a backpack is looking up at a mean monster, who is dressed in a shirt and tie. This picture shows a boy with an iPad tablet computer. Perhaps he's using Facetime or looking at digital photos. This picture shows a a little girl watching a magician as he makes a rabbit disappear from his hat. In the background we see the bunny hopping away. This picture shows a young farm girl excitedly looking at horses. A boy is looking up at his kite, which is caught in a large tree. This picture shows two kids with a baby buggy snooping around a huge, dilapidated, spooky Victorian house. The boy in this graphic is daydreaming of becoming a skiing champion. Two kids are washing a car. Write a few paragraphs to go along with this storypic. The young man in this picture is roasting a marshmallow over a bonfire. This picture shows nervous young girl and her mother in a doorway. The girl is holding a rainbow lunch box. This picture shows a child who dropped her ice cream cone on the ground. A small kitten has come up to lick up the mess. This picture shows a young detective with a magnifying glass, searching for clues. A girl in a long dress is trying to catch butterflies and insects in a net. In this picture, a boy is standing on a dock, pointing to his small rowboat. A man on overalls is leaning inside the hood of a car, trying to figure out what's wrong. Three people are having cake to celebrate a birthday. On this worksheet, you see two firefighters - a man and a woman. Write a creative a story to go along with the picture. This chaotic scene has dogs, cats, turtles, and birds. In this picture a boy is handing an apple to his teacher. Write a fun story to explain what's happening. What is this girl typing into her laptop computer? Write a thoughtful story that explains what the picture is about. Color the picture of this unusual tennis match and write a story to explain what's going on. This picture shows a dog chasing a mailman down the street. Students can write a story to tell what, exactly, is happening. A girl is looking out of a window and sees a swarm of buzzing bumble bees. This boy is reading a note. He looks nervous! Why? Why is this baker frustrated? Color the illustration and write a creative story. This girl seems to be helping her father with his computer troubles. Explain the scene and color the picture. In this illustration, a girl is singing and dancing, with music notes all around her. A child is standing in the lunch line and he/she can't decide whether to choose veggies or pizza. This little mouse has found a different kind of mouse. Explain what this little fellow is thinking as he holds up the computer mouse. Here's a picture of a man with a suitcase and passport. Where is he going? Write a narrative and color the picture. These two friends are rockin' away on their guitars. Color the graphic and write a story to tell what's going on. The scuba diver has made a new underwater friend. Write a short story that explains how they met and color the underwater scene. Why is this angry man climbing the ladder? Students color the picture and write a creative story. It's a car with hands! Write a story to explain this most unusual picture. Then, color it in. A cat and a dog and a mouse chase each other. Your students will enjoy writing a creative tale to describe this scene. In this illustration, a pig is looking at a small spider. Color the picture and make up a story to tell what's happening. Invite your students to tell why this elephant is all dressed up! Students write a story to explain why this angry horse is chasing the rancher across the desert. How did this cute little squirrel find this loaf of bread? And what will he do next? It's a treasure map! Students can tell you where it leads, and what can be found at the end of the trail. In this picture, a small puppy is confidently walking past a very large cat. This picture shows Goldilocks in a chair, with the three bears around her. Students write a short story to tell what's happening in the illustration. The three little pigs look very fearful. Why? Write a brief story to explain the situation. A superhero is flying through the air with a birthday cake. Write a creative story to go along with the picture. It's Christmas and the elves are on strike! What will Santa do? Write a holiday story to go along with this picture. What is the world did Santa find in his bag!?! This one is a favorite with kids. Create a Christmas story to explain this unusual picture. This fox is dressed up as Santa. Write a story to explain why. Santa's taking the night off and this reindeer is carrying his sack. Students can write a story to explain the picture. Santa's been caught playing video games when he should be delivering presents. Create a funny story to go along with the picture. A girl made a mug to give to her dad on Father's Day, but now it's broken! What will she do? A scary Halloween jack-o-lantern is chasing this dog! Students can write about the picture. Something is scaring this trick-or-treater...what could it be? Students develop a story to explain why this person is so frightened. A gruesome werewolf is scaring everyone in town. Write a Halloween story to go along with the picture. Eeeew! Would you eat a burger with eyeballs in it? Students can write about the gross picture. These two friends can't decide on the best way to carve this pumpkin. Maybe your student writers can help. A boy is looking at a menorah. Write a story to go with the graphic. The mouse is being chased by a dreidel! Write a Hanukkah story to describe the cartoon. A mother is hugging a child, who is holding a special Mother's Day card in his hand. This man has caught a little leprechaun! Write a St. Patrick's Day story to go along with the picture. These two octopi are in love with each other. Write a Valentine's Day love story to describe the picture. A giant puppy and a tiny kitty make an unusual pair, but they do seem to care for each other. Write a Valentine's Day story to describe the picture. This little guy doesn't look like he's too fond of winter. Write a story that tells what's happening in the cartoon. 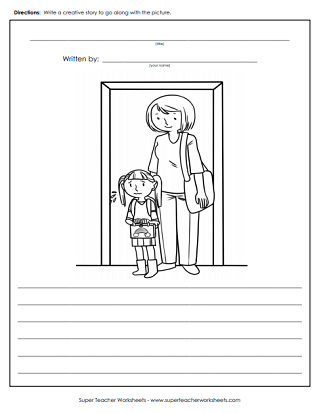 Even more worksheets to help teach writing skills. Students form an opinion on a given topic and write a persuasive essay to support their view.